When the postman dropped the packet in my mailbox, I thought it was 'Umang', the Delhi Urdu Academy's magazine for children, which my kid daughter subscribes. But it was a pleasant surprise as NCPUL's newly launched 'Bachchon Ki Duniya' came out from the packet. It is an eye-catching colourful magazine published on glazed paper. Costing just Rs 10, this magazine matches the best Urdu publications in the world. It also has ample cartoons unlike other magazines [in India and Pakistan]. For readers who still love to read children's magazines and comics or who need magazines for their children, it is a great gift. Nearly 12 Urdu magazines for children are published in India but Bachchon Ki Duniya is surely going to give them a run for money. The stories have been chosen with great care. Especially, famed writer and editor of Shesh, Hasan Jamal's Phislan, which is a landmark story. Even the poetry section is interesting. Poems like 'Jebkatre ki Dua' [Pickpocket's prayer] will definitely make you laugh. The quality of stories is really surprising. They want not just the child to be entertained but also learn something, without turning the story into dull prose. Accompanying photographs and illustrations are no less enchanting. 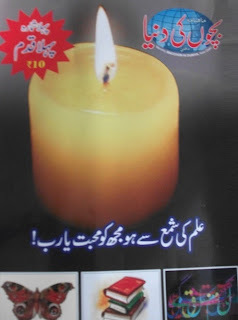 The standard of printing is comparable to Phool, which is published from Lahore [Pakistan] and is available on internet. From the article on 'Buddhism' to 'General Knowledge' section, every column in 'Bachchon ki Duniya' is worth reading. Works that would surely classify as standard children's literature has been printed in this magazine. There are translations of stories from Denmark, Jordan and Iran. Then, there is poetry by late Raja Mehdi Ali Khan and Gulshan Bawra. Year 2013 has also been good for Urdu language and literature. 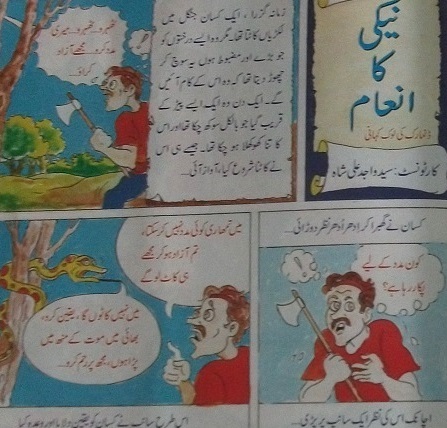 The much-awaited children's magazine, 'Bachchon ki Duniya' has finally begun publication and the first issue really rocks. Now, we can't lament the loss of Shama group's Khilauna magazine. We also have Noor, Hilal, Umang, Gull Bootay, Ghubbara, Payam-e-Talim, Sada-e-Atfal, Achha Saathi, Fankar, Guldasta-e-Talim published from Delhi, Rampur (UP), Bengaluru (Karnataka), Maharashtra and other parts of India. I am mentioning some of the writers' names in the index: Gulzar, Nusrat Zaheer, Rashid Jamal Farooqi, Mohsin Baashn Ishrat, Raza Jafri et al. The National Council for Promotion of Urdu Language (NCPUL) or the Qaumi Qaunsil Baraye Farogh-e-Urdu has been doing nice work under Khwaja Ekramuddin. Thank you once again Khwaja Sahab. Year 2013 has also been good for Urdu language and literature. We have seen newspapers being launched, quality of printing improved and also efforts towards increased presence of Urdu on internet. UNI has today launched its Urdu news website. There are a host of good stories since the year 2012. Hope it will continue in future. So what are you waiting for? Do subscribe these magazines* for kids mentioned above. For Bachchon Ki Duniya, the annual subscription is Rs 100. So don't stop at reading this post. Do subscribe the magazines.